This book is an interesting proposition: It is a number of philosophical arguments presented as poems, as lyrics. Although they do not contain imagery and particularly clever turns of phrase that makes for good poetry, the line-broken and metered presentation makes for easy reading of a philosophical argument. The main piece within the book, “On the End of Technological Civilization”, presents a mathematical argument that technology is destined to fall because, basically, in a long enough timeline, all possibilities will come true, including the fall of the civilization. I don’t buy it because every moment brings new possibilities that did not exist the moment before, so the finite infinity projected might not apply to history as it does to mathematics. 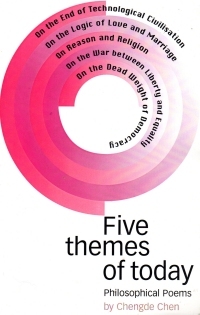 The other ‘themes’ are longer musings on the logic of love and marriage, reason and religion, the war between equality and liberty, and the dead weight of democracy. They’re followed by some shorter little riffs on more topical subjects. I found all of them engaging, but although I did not agree with much, I did enjoy the presentation of the arguments. I would have expected the bits, particularly the one on reason and religion, to be a little more informed by the Chinese perspective, but it focused on Western religion instead of the Chinese beliefs, for example. An interesting bit about this particular volume. 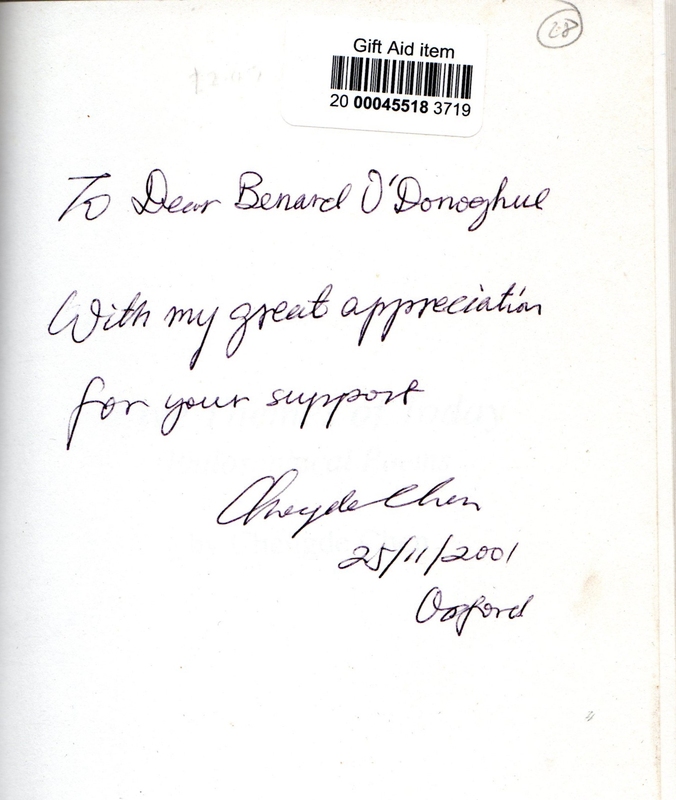 This appears to be a copy inscribed by Chen to his Oxford colleague, poet Bernard O’Donoghue. The sticker indicates it was a charitable donation at some time, and fifteen or so years later it ended up in Springfield, Missouri. Man, I feel for Chen here: A personal gift of his book with an inscription put in the Goodwill pile. I remember when I saw a copy of John Donnelly’s Gold listed on Amazon by a used bookstore in Indianapolis, and I knew which copy I’d mailed off that got there. I feel you, brother. At any rate, like I said, a good intellectual read and an interesting presentation and easily digestible presentation of the material. It led me to wonder if I could make a philosophy book completely out of bullet points or ordered lists for modern audiences to understand. Perhaps someday.